Here’s a little magic trick for you: It’s called making dinner with almost no dishes! No pans, no skillets. Everything in this easy supper is baked together on one big sheet pan! While the sheet pan supper bakes, you can actually even clean up the mixing bowls and stuff and when dinner is served you have almost NO cleanup. That’s a breath of fresh air for any weekday dinner. Plus, it’s a pretty stress-free trick and as long as you add the ingredients in the right order, everything turns out perfectly! When it’s supper time, embrace the sheet pan! This quick recipe makes dinner possible without too many dirty dishes. Just a sheet pan! The trick is in the ingredient order! 1) Preheat oven to 375 degrees F. Cut whole chicken into thighs (leave drumsticks attached). Try to keep the breast whole with the bone-in. Also cut off the wings. So you should have 5 pieces: 2 wings, 2 thighs, 1 whole breast. 2) Toss chicken pieces with 2 tablespoons olive oil, chili powder, and a big pinch of salt and pepper. 3) Spread chicken pieces out on a sturdy sheet pan, skin side up. 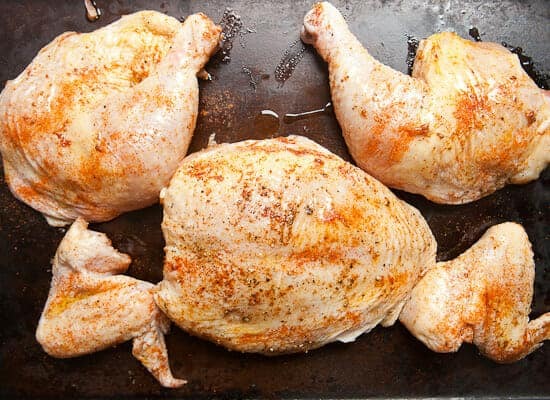 When oven is hot, bake chicken for 15 minutes. 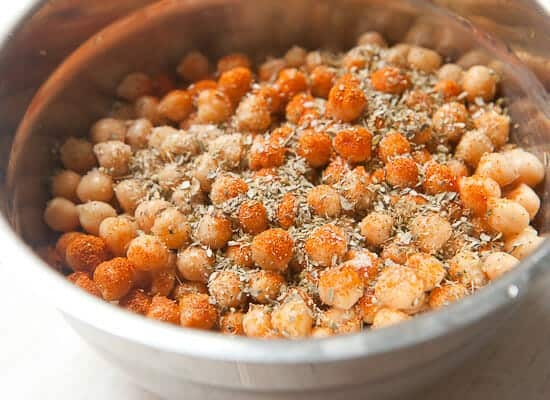 4) Meanwhile, drain chickpeas and toss with 1-2 tablespoons olive oil, paprika, oregano, and a pinch of salt and pepper. 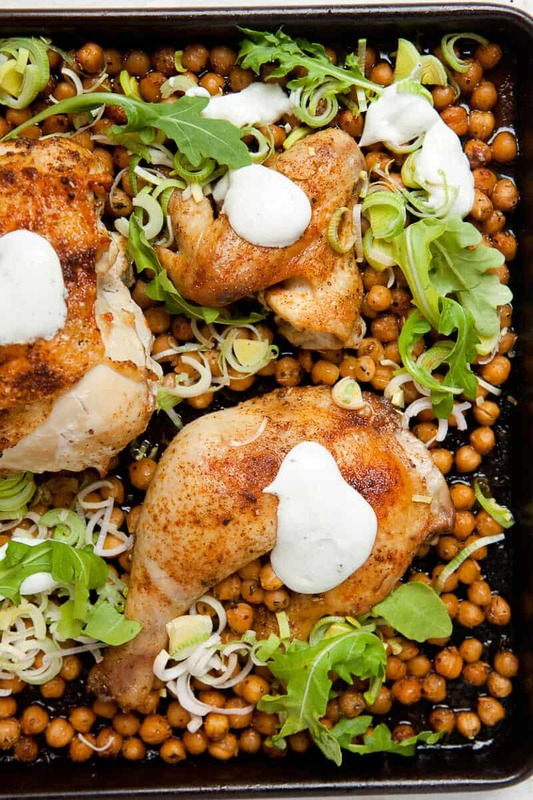 5) After 15 minutes, add chickpeas to the sheet pan, sprinkling them around the chicken pieces. Return to the oven and bake for another 20 minutes or so. 6) While sheet pan bakes, prep yogurt sauce and slice leeks. Add leeks to sheet pan after the 20 minutes are up and return to oven. 7) Bake chicken and sheet pan until chicken is cooked through on the thighs and breasts. Ideally, the breast should be 165 degrees F. in the thickest part. The thighs should be a bit hotter, maybe 175 degrees F. in the thickest part. In total, they will need 40-45 minutes total baking most likely. 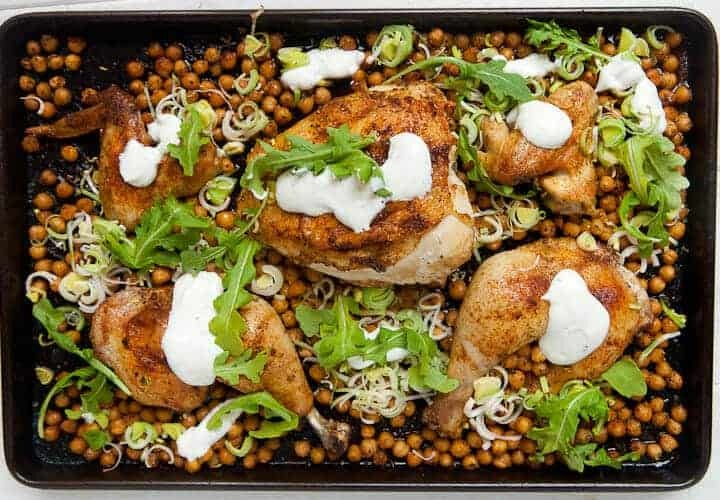 8) When sheet pan is done, serve chicken and chickpeas over fresh arugula with yogurt sauce. This dish will be kind of wasted if you use boneless skinless chicken. If you do use it though, just use all the same cut. You’ll have to watch the temperature and you’ll probably just want to toss everything together (chickpeas and chicken) and bake it together. The best scenario though is to use a whole chicken. You can cut it up yourself or these days you can find whole chickens already butchered. The nice thing about doing it yourself is you can cut it into exactly what you want. For me, this was the thighs (leaving the drumsticks attached) and the leaving the breast whole with the bone in. Keeping the chicken in these big pieces will mean that they are done at basically the same time and won’t dry out. If you need help butchering a chicken like this, I think it’s best to see somebody do it. Here’s a great video (sound) from the NY Times on how to do it easily. Once your chicken is ready though, toss the pieces with some olive oil, chili powder, salt, and pepper. Lay these pieces out on a large sheet pan with the skin-side up. Get these started in a 375 degrees F. oven! There’s no big starch in this dish. The chickpeas make up for it though. They are filling and get nice and crispy in the hot oven. To prep the chickpeas, toss the drained chickpeas with olive oil, salt, pepper, paprika, and dried oregano. 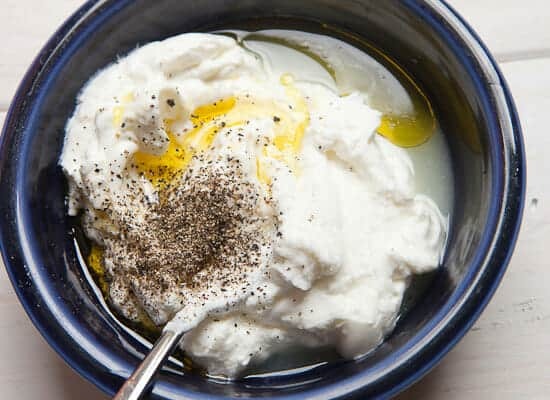 You can also make the yogurt sauce for later while your chicken is in the oven. Stir together the sauce ingredients and you’re all set. 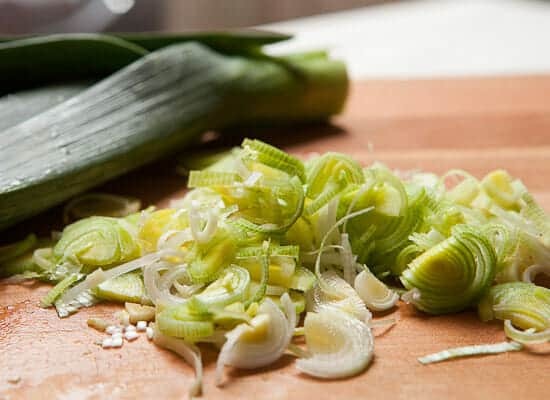 While you’re at it, chop up a few leeks. If possible, try to find smaller leeks. They are more tender and great for a dish like this. Just use the white and pale green parts. The important thing about this dish is to layer the ingredients in the right order. 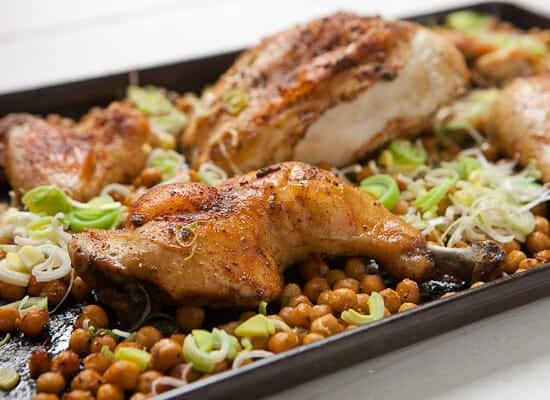 If you toss everything on the sheet pan, by the time the chicken is cooked, the chickpeas and leeks will be overcooked. So after the chicken has cooked for 15 minutes or so, it should be browned nicely but nowhere near cooked through. Then add the chickpeas spread around the chicken. Back in the oven it goes for another 20 minutes or so. Then add the sliced leeks! 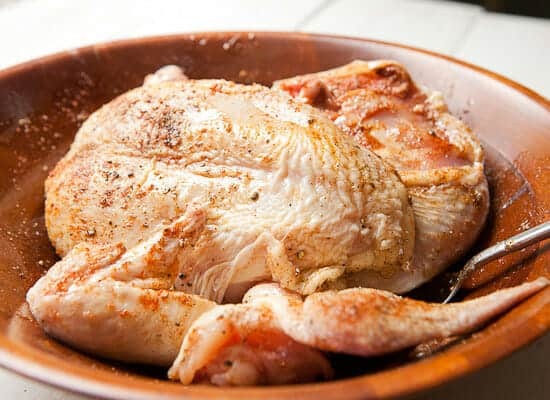 To finish the chicken, it will probably need another 5-10 minutes in the oven if you are using a whole chicken like I did. 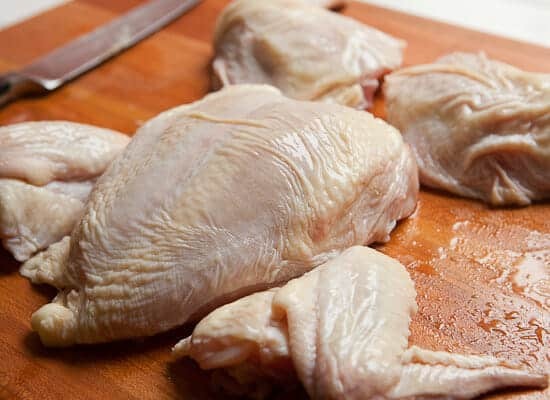 At the end of the day, you’ll want to test the temperature of the chicken with a meat thermometer and it should register 165 degrees F. in the thickest parts of the breast. The thighs can be a bit hotter with no issue since they are fattier. For serving, you can drizzle the yogurt sauce over the whole sheet pan or serve it on the side. Pile the chicken and the chickpeas high on fresh arugula and dinner is done! Make it even easier, line your sheet pan with aluminum foil first and clean up is even easier. I line mine because some of my pans are somewhat rusty and the nice ones I keep reserved for baking cookies. Great tip Cathy! Thanks for the comment! 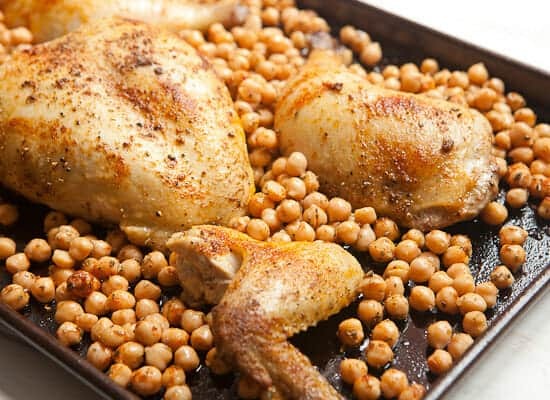 Awesome, but at present I am SO addicted to Cast Iron BBQing, so this will go in my Fancy Dancy cast iron, with a dash of Za’atar, well more than a dash.. this spice is so awesome on chicken and hey, even more so with the chick peas.. so doing this for supper..
That sounds like a plan Marilyn. This would be a great cast iron dish also! That sounds fancy Felicity! Love it! It’s actually borrowed from Jamie Oliver. Really easy but it looks quite fancy. You can do 1 or 10 chicken breasts & pretty much any vegies will work. This was wonderful! My 4 year old and 1 year old loved it (except for the arugula). I misread the recipe and used 1 T of chili powder instead of 1 t, and it had a great amount of spice. We will be making this again. Thanks for another hit at dinnertime! I made this for dinner tonight and it turned out even better than I expected! And yes, my kids (3 and 6) didn’t mind it either which is pretty good for those two picky eaters. I didn’t have leeks so I used shallots, and I added some cilantro to the yogurt sauce. I LOVE the idea of using Za’atar – I’ll have to do that next time!